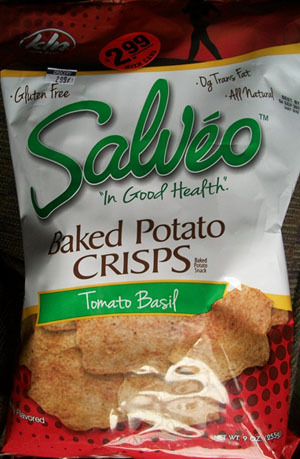 These Salveo crisps were picked up at the local MetFood in Brooklyn for $2.99 on sale. Being baked not fried makes them taste lighter than standard potato chips and not greasy at all. The crunch level is quite high considering this. If you’ve tried baked lays, you’ll have a sense for the texture and taste of these. The tomato flavor is creamy and a bit sweeter than expected though in a positive way. The basil is more noticeable in aroma rather than flavor. I found them satisfying and also addictive. These are RoodonFood approved – will definitely be purchased again. Other flavors include Southwest Ranch, BBQ, Original Sea Salt. Unfortunately their parent company, KLN Family Brands doesn’t appear have a website so a store locator link isn’t available. Salveo itself is on facebook however.